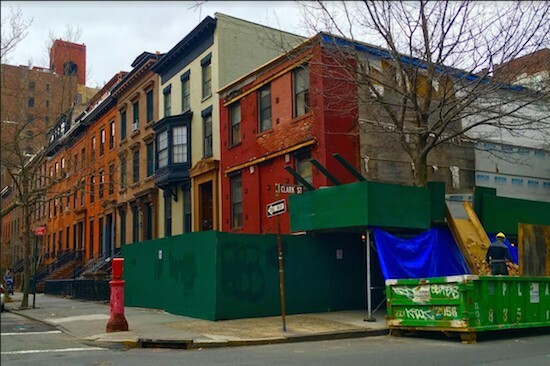 Here’s a piece of promising news for Brooklyn Heights Historic District residents: Work is underway in earnest to reconstruct a pre-Civil War house that is one of the area’s few eyesores. Look up on the roof of 100 Clark St. the next time you’re in the picturesque, pricey brownstone neighborhood. You will see workers trundling wheelbarrows full of rubble across the roof of the property and sliding it down a chute to a dumpster. This is a heartening sight for residents who’ve been waiting since 2008 for salvation for 1 Monroe Place, as it’s also known. It belonged to the Penson Cos. back then. The city Buildings Department, citing hazardous conditions, sent a wrecking crew to tear down the house on Memorial Day weekend of that year. It was half razed by the time the Penson Cos. went to court and got the demolition stopped. Real estate investment and development firm Newcastle Realty Services bought the building — or what was left of it — through an LLC for $1.25 million in 2010, city Finance Department records indicate. 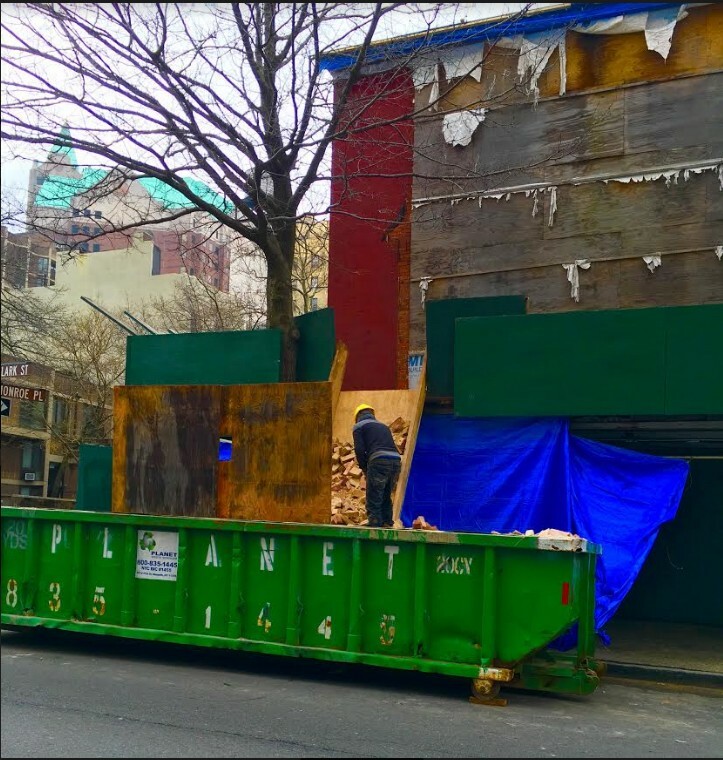 Now, after a waiting period that has seemed like an eternity to neighborhood residents, there’s pre-renovation demolition and structural shoring going on, and the first phase of structural reconstruction is getting started. “We are underway,” Margaret Streicker Porres, who is Newcastle Realty Services’ founder and president, told the Brooklyn Eagle. Before it was partly torn down, 100 Clark St. was a red-brick Greek Revival-style house that had been built in 1852, with a mansard roof added later. The house is situated on a prominent corner at the end of a single-block street lined with prized pre-Civil War rowhouses — including 27 Monroe Place, which is in contract for what might turn out to be a record-breaking sum. Streicker Porres is reconstructing 100 Clark St.-1 Monroe Place according to plans that the city Landmarks Preservation Commission approved in August 2016. 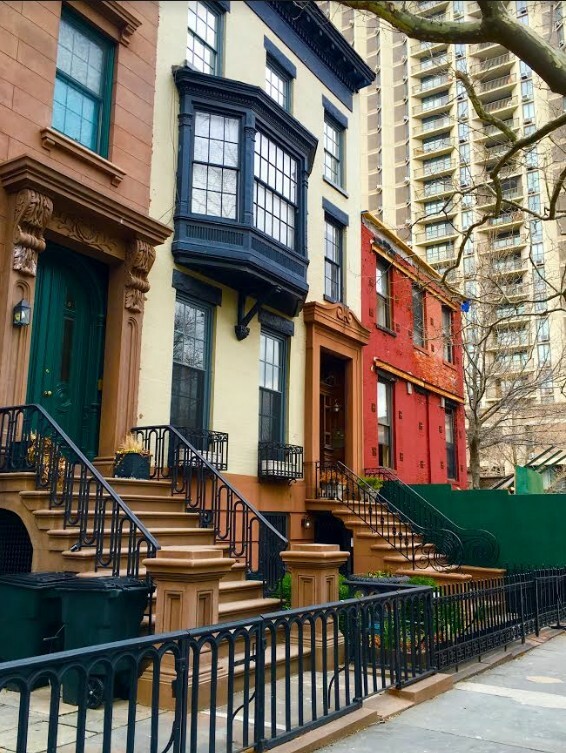 “It’s going to be a cornerstone of Brooklyn Heights again,” she said. 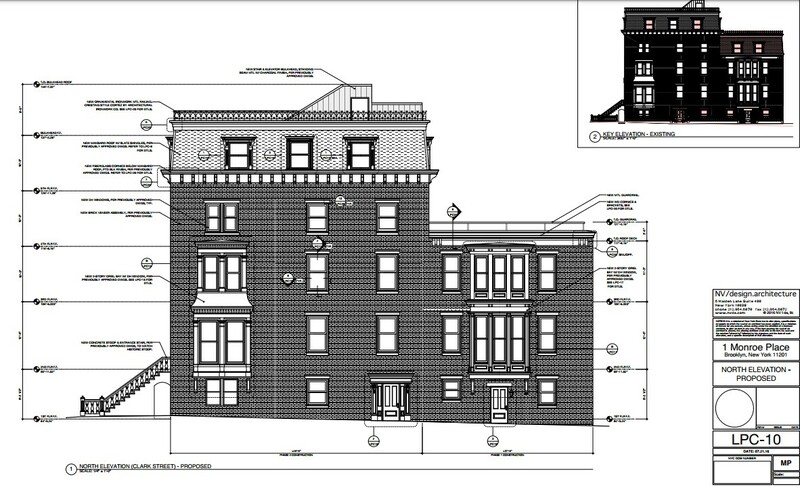 The portion of the rebuilt house that faces Monroe Place will be five stories tall. It will have a mansard roof with slate shingles and an ornamental ironwork railing, and a stoop to replicate the one that was removed long ago. The back of the building will be three stories tall. She cautioned that the timetable for completing the rebuilding is going to be longer than for an ordinary project of this size because of the complexity of the permitting sequence. The first portion of the structure must be completed and signed off on by the Buildings Department before Newcastle Realty Services can pull permits to construct the rest of the project. Streicker Porres said she’s got a project architect with lots of experience with historic properties, Tom van den Bout. Neighborhood residents will recall that he’s a former president of the Brooklyn Heights Association. His firm, NV/design.architecture, has completed projects in 25 percent of the city’s historic districts. Silvia Portilla of Newcastle Realty Services is the owner’s rep for the 100 Clark St. reconstruction project. By the way, as the Eagle previously reported, the apartments in reconstructed 100 Clark St. will be rentals rather than condos. Streicker Porres — who has a bachelor’s degree from Princeton and both a master of architecture degree and a master of science of real estate development degree from Columbia — has dealt with badly battered landmarks before. 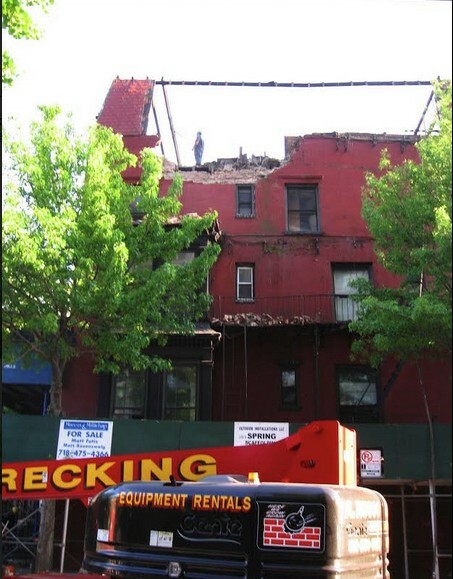 She rebuilt a row of West Village buildings with partly collapsed façades. 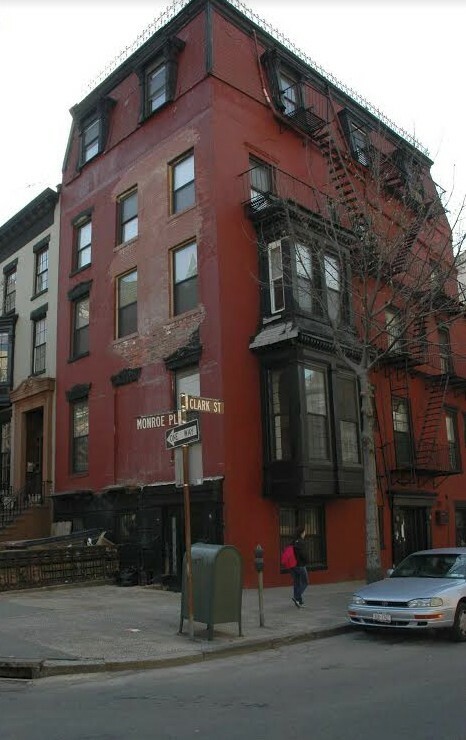 After their restoration, the nine condos she created in one of the buildings, 84 Bedford St., sold quickly.